Ball Formation – Surface tension of water & gravitational force creates pressure on particles, so they coalesce together & form nuclei which grow in size into ball. The forces responsible for the agglomeration of iron ore fines are surface tension and capillary action of water and gravitational forces of particles due their rotation in balling unit. When the solid particles come in contact with water, the ore surface is wetted and coated with water film. Due to the surface tension of water film, liquid bridges are formed. As result of the movement of particles inside the balling unit and of the combination of the individual water droplets containing ore grains, first agglomerates, called seeds, are formed. The liquid bridges in the interior of these seeds hold them together as in a network. With the further supply of water, the agglomerates condense and become denser. Capillary forces of liquid bridges are more active in this stage of green ball formation. The optimum of this ball formation phase is attended when all the ports inside the balls are filled with liquid. When the solid particles are fully coated with water, the surface tension of water droplets becomes fully active dominating the capillary forces. Besides this effect, the rolling movement of grains and movement or shifting of particles relative to each other plays an important role. Pelletizing in discs – Green pellets with a size range of 8-16 mm are prepared in balling drum or discs. Discs are preferred to produce quality green pellets as these are easy to control operation with minimum foot space. The disc is an inclined pan of around 5 to 7.5 meters diameter rotating at around 6 to 8 rpm. The inclination of disc is around 45 Deg. and it can be adjusted in the off-line between 45 deg. to 49 deg. The pre wetted mix is fed into the disc at a controlled rate. Ore fines are lifted upwards until the friction is overcome by gravity and the material rolls down to the bottom of the disc. This rolling action first forms small granules called seeds. Growth occurs in the subsequent revolutions of the disc by the addition of more fresh feeds and by collision between small pellets. As the pellet grows in size, they migrate to the periphery and to the top of the bed in the discs, until they overflow the rim. Pellet growth is controlled by the small amount of water sprayed in the disc and the adjustment in the disc rotational speed. The green pellets are then screened in a roller screen and the required size material is fed to the traveling grate. Firing of pellets at around 1300 Deg. C to sinter the iron oxide particles. Cooling of hot pellets before discharging. Solid oxide bonding: Oxidation of ferrous iron oxides to ferric iron oxides results in bonding and bridging, but only to limited amount. Re-crystallization of iron oxides: Essentially a physical process in which smaller particles consolidate into larger ones with the loss of surface energy. Continued growth of iron oxide crystals imparts sufficient strength. Grain growth for hematite starts at around 1100 deg C.
Slag bonding: Gangue by forming melt transport medium for ferrous or ferric oxides facilitate grain growth and crystallization of oxide grains. It also enables the mechanism to proceed at lower temperatures than would be required in its absence. This treatment (Induration) causes certain chemical reactions to occur that change pellet’s specific metallurgical properties. These reactions may include the oxidation of magnetite and dehydration of earthy hematite. For BF grade “fluxed pellets” are produced by additions of limestone, dolomite, silica, etc. to the balling feed. These additions react with the gangue in the iron ore to enhance the performance of the pellets in certain downstream processing steps. 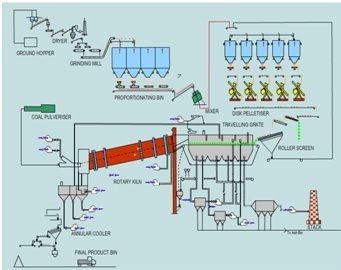 Pellet cooling and handling – The pellets are then cooled and screened. The over size is crushed and along with the undersized is sent to the stock house bins where they are reprocessed. The Straight Travelling Grate process (Fig 2) developed by former Lurgi Metallurgie accounts for world’s major installed capacities. In this process a double deck roller screen ensures right size of green pellet (8-16 mm) is evenly distributed across the width of the travelling grate. The grate carries the green pellets on a bed 300 mm to 550 mm thick through a furnace with updrafting, downdraft drying, preheating, firing, after firing and heating zones. The Grate Kiln Process was developed by Allis Chalmer and the first plant on this technology was constructed in 1960. 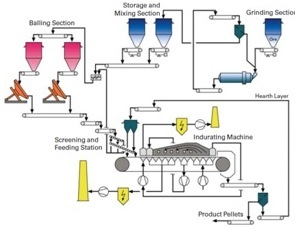 In the Grate-Kiln process (Fig 3) the traveling grate is used to dry and preheat the pellets. Material moves on straight travelling grate till it attains the temperature of 800°C to 1000°C. Thereafter it is transferred to refractory lined rotary kiln for induration where the temperature is further raised up-to 1250 – 1300°C. At 800°C, the Magnetite iron Ore gets converted into Fe2O3 in an exothermic reaction. The liberated heat hardens the green balls which is helpful to withstand the tumbling impact in the rotary kiln. A circular cooler is used for cooling of the fired pellets. 2 Green pellets remain undisturbed during the process Entire process takes place in three equipments namely travelling grate, rotary kiln and circular cooler hence pellets transfer takes place. 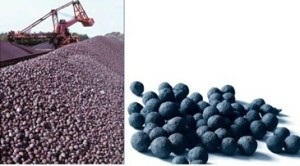 11 Suited both for hematite and magnetite ores Process is more suited for magnetite ores..
Pellets have good reducibility since they have high porosity (25-30%). Normally pellets are reduced considerably faster than sinter as well as iron ore lumps. High porosity also helps in better metallization in DRI production. Pellets have a uniform size range generally within a range of 8 -16 mm. Pellets have spherical shape and open pores which give them good bed permeability. Pellets have low angle of repose which is a drawback for pellet since it creates uneven binder distribution. The chemical analysis is uniform since it gets controlled during the beneficiation process. Fe content varying from 63% to 68% depending on the Fe content of Ore fines. Absence of LOI is another advantage of the pellets. Pellets have high and uniform mechanical strength and can be transported to long distances without generation of fines. Further it has got resistance to disintegration. High mechanical and uniform strength of pellets is even under thermal stress in reducing atmosphere. I am happy to know that this website will be helpful to all lovers of iron & steel connected people. I am really v happy that though for short span i was associated with you in Sona Alloys Pvt Ltd. I will sure give information to my HOD’s and our Technical staff to whom this website will be very helpful. (Manager-Stores-Pellet Plant). – What will be the impact on pellets during reduction process in a coal base sponge iron kiln if -325 mesh is ~80% to 85%? Is there Fe loss in E.S.P. reducing sponge iron yield? – On which factors does the Blaine no of filter cake depends?